The Pavilion at Patriots Point, in Mount Pleasant, Sc, offers a setting and venue that is completely unique. It is their belief that there will never be two weddings exactly the same. 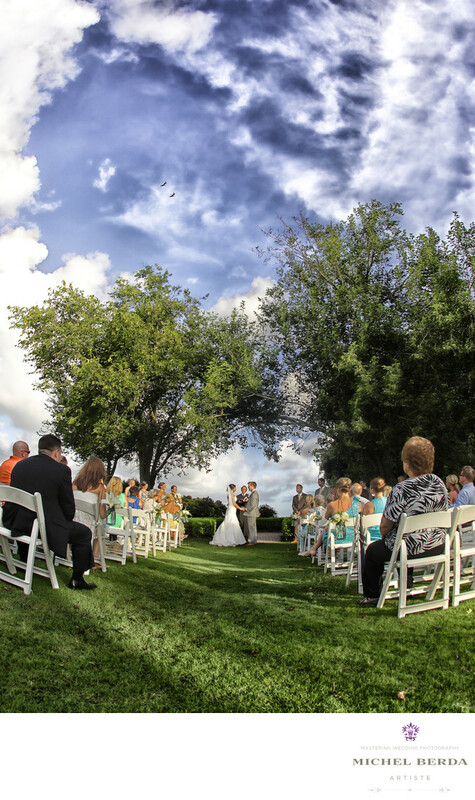 It is one of the busiest wedding venue in Mount Pleasant,SC. The ceremony and the reception is usually on the 18th lawn. This venue is very secluded where you feel like no one is around, very private and quaint, the outdoors setting with the spanish moss trees are so lovely there and makes a perfect background for the ceremony. The ultimate waterfront wedding for the perfect I do. I have captured many weddings at The Pavilion at Patriots Point. As in this image in particular, that I captured on that day for my clients. I loved the beautiful day we had, the blue sky, white clouds, green grass and by having the right photographic equipment on me at all times, witch included one of my camera always with a fisheye lens, for this specific reason. Concentrating on the composition field of view, and making sure that the focus went to infinity, with great depth of field, I was able to get such a beautiful ceremony wedding image for my clients.Keywords: Patriot Point Pavillion Wedding (3).